Pictured (from R-L) are: David Kramer, Senior Director Information Technology; Ed Metcalf, President North America & COO; Rebecca Rothberg, Sales Promotion Associate; Matt Carli, Manager Business Development; Eerik Maandi, Vice President R&D; and James Bouldin, Vice President Operations. 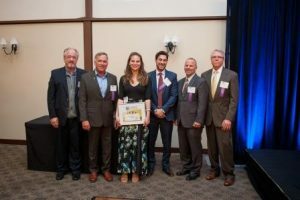 LATICRETE has been honored by Hartford Business Journal at its 2017 Family Business Awards, which recognize outstanding achievements in family-owned businesses across the Northeastern region. In 1956, Dr. Henry M. Rothberg, revolutionized the tile and stone industry when he developed the first commercially accepted latex modified adhesive, thus changing the way building had been done for almost 1,000 years. Dr. Rothberg’s research and development not only ignited LATICRETE as a trailblazing innovator within the tile and flooring industry, but set the standard for all modern tile and stone adhesives used today. Significant achievements that received notoriety included the launch of the industry’s first high-strength, chemical-resistant epoxy adhesive for installing stone and tile and the opening of a new 70,000-square-foot in Grand Prairie, Texas — nearly doubling the existing 100,000-square foot (9,290-square meter) facility, making it the company’s largest manufacturing and distribution center outside of the LATICRETE headquarters in Bethany. The acquisition of global licensees LATICRETE Costa Rica, LATICRETE Norway and LATICRETE Italia are additional hallmarks of the company’s growth and allow LATICRETE to function as a local company in every community served.